Video of a 400-year-old Ginkgo tree in Wakayama, Japan. * Added many photos of Ginkgo trees in France. * New photo photospecial page: Ginkgo of 1845 in Tours (France) with grafted female branch. 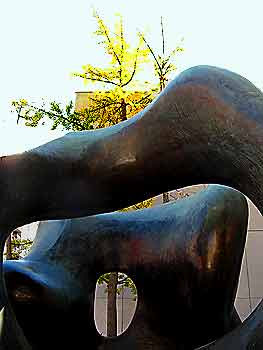 Henry Moore sculpture outside at the Art Gallery of Ontario (AGO) in Canada. It was all covered up during the construction for the last few years and finally it was back again. The Ginkgo tree is visible behind the sculpture. Summer writes on his blog: "I sit and watch the tree regularly. The image of it has become a part of me. But I want more from it than its beauty—even more than its shade. I want the tree to speak to me. .......I want to know how old the tree is. I sit at its edges, lean against its base and look out at the world it sees—simple wood homes filled with families, shouting, wiggling teenagers walking home from school and cars hurriedly trying to get somewhere........One November morning, I awoke to the sound of rain. Except it wasn’t quite the sound of rain. It was soft and padded in some way. It was a sound I’d never heard. It was like what you would expect snow to sound like if snow made noise when it hit the ground. My ears loved it. I sat up, peeked through the blinds, and was startled by what was there. I jumped out of bed. I walked out my front door, clothed in pajamas and looked up in amazement as every leaf fell from my tree. It was raining yellow gingko leaves. My walkway was covered in gold." * Added in videos section: Japan's biggest Ginkgo tree, over 1,000 years old. * Added in videos section: famous Ginkgo tree in the Tianmu Shan Reserve in China. * Added HD-video: Ginkgo trees in Sapporo, Hokkaido in Japan (video on bottom of this page). * Added on my Art-page gallery: woodblock print by Shiro Kasamatsu and Ginko Carbon Table by Ross Lovegrove. * Added photo: Birds and Ginkgo: Waxwings on Ginkgo branch. 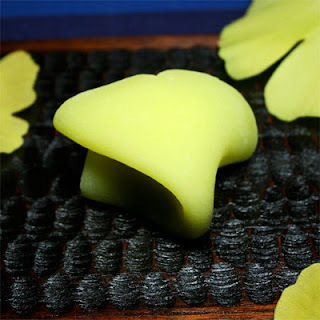 Namagashi are a type of wagashi, which is a general term for snacks used in the Japanese tea ceremony. Namagashi may contain fruit jellies or sweetened bean paste. More photos and blog article click here. * Added videos: 700-year-old Ginkgo at Tokyo Zenpukuji Temple in Azabu Juban, Japan + video Ginkgo rain 2008. 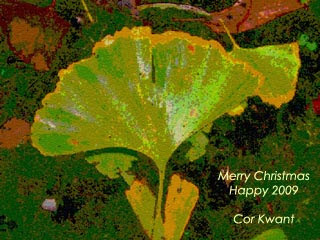 * Added photos from readers of Ginkgo trees in Slovenia, Croatia, China, Germany, Belgium and the Netherlands. The Ginkgo tree has survived dramatic climate changes for over 200 million years. The perfect specimen to grow, then, in these uncertain times, says Dan Pearson (the Observer's green-fingered guru on all things horticultural) in an article in the Guardian/The Observer, of Sunday November 23, 2008. He also writes about Metasequoia glyptostroboides and other Jurassic park trees.